Welcome to La Grande Bergerie. 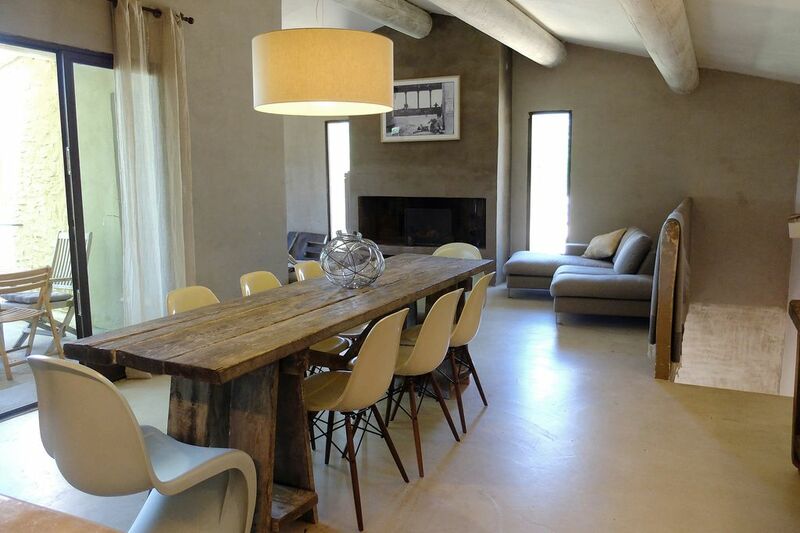 Our design vacation home is nested in the heart of Luberon, Provence, tucked on the side of a quiet little hamlet, nearby the village of St-Saturnin-lès-Apt. Once a shepherd's stone house and barn renovated in 2008 into a contemporary and authentic family home. The house features 4 bedrooms, 2.5 bathrooms, ideal for extended family gatherings, up to 9 guests. The house main living space is on the second floor. You enter into a voluminous space of 650 sq ft featuring the living room with wood burning fireplace, a dining area opening to the private terrace and an open floor kitchen. The kitchen has a central island, a large 6 burners range, dishwasher, fridge-freezer and microwave oven. On this same floor is an entertainment room with TV/DVD and sofa, a guest bathroom and a large master bedroom (king bed) with a claw foot tub and a private vanity. Upstairs are 3 bedrooms (one with a queen bed and two with double twins) that share a bathroom with shower. WiFi is available in the entire house. In addition, you will find a Bluetooth "jambox" speaker in every adult bedroom to play your favorite music. The garden (13000 sq ft) opens up to vineyards and truffle oak trees rolling hills. A lawn and centennial olive tree greet you by the pool, where you can sunbathe or play ball. When lunch time, harvest a hand full of herbs from the quaint squared garden. The pool is unfortunately closed during the winter months (please check our other listing for summertime). Parking on the property for 3-4 cars is available and secured by an automated gate. Rentals are 3 nights minimum, except during the Christmas and New year holidays, where we rent on a weekly basis. Check-in Saturday 4-6pm, check-out Saturday 10-11am. All rentals include bed/bath linens, and end-of-stay cleaning. For any stay longer than one week, one house cleaning will be included on Saturdays with all house linens replaced. For your convenience, a guest washing machine is also available. Babies are welcome and upon request, a high chair and portable baby crib will be installed. Access to the entire home and garden. Please, note that the house is on 3 floors, with steep staircases and very little railing, making it insecure for young toddlers. We are a French family (originally from Brittany and the French Riviera) and are currently living in San Francisco. Our Provence home is our peaceful and rooting retreat, a place for us to bike, scavenge antiques and drink lots of wine with friends! Upstairs bedrooms all have portable AC units. All rentals include bed/bath linens and pool towels. Washer is available for any stay. The famous Mistral (local wind) is our natural dryer! WiFi is available in the entire house. In addition, you will find a Bluetooth 'jambox' speaker in every adult bedroom to play your favorite music. We provide kitchen basics such as salt, pepper, olive oil as well as dish soap, sponge and trash bags. The kitchen has a central island, a large 6 burners range, dishwasher, fridge-freezer and microwave. 3 Jambox spread in adult bedrooms. Two restored vintage bicycles, 3 speeds. Relax by the pool or stroll farmer's markets for your lunch menu. Cycle up the infamous Ventoux or bike around the gentle hills and vineyards tiny scenic roads. Provence is also known for its antiques markets and casual brocantes, where you may find some true vintage treasures. Below are highlights on what we like to do most when we come to Provence . . . Enjoy! Our house is located roughly 2 Km away from the village. Two renovated vintage bikes (3 speeds) are available for use to our guests. Ride on! All rentals include bed/bath linens, and end-of-stay cleaning (180 €).